The Generation Game is living proof that you can’t keep a good TV format down. The format, originally from Holland, is nearly fifty years old and has already enjoyed four incarnations and three hosts plus a number of one-off specials on the BBC. Who you most associate with the show will depend on your age (a bit like “who was you Doctor Who?”). Bruce Forsyth was the longest serving host, clocking up ten years over two outings, in the seventies and nineties; Larry Grayson’s tenure was only three years, but he is still more associated with the programme than Jim Davidson who saw the show through the nineties and into the noughties. So sixteen years on (which is a least a generation in TV terms) it’s been deemed that the time is right for a revival. A lot has changed in the forty-seven years since the show first aired, but one thing that has remained rigidly intact is the format. Four sets of couples, each couple consisting of members from two generations of the same family, compete in rounds where they have to make something and copy something; the final two couples take part in a daft sketch where they read their lines off props on set and the winning couple goes through to the final round where they have to memorise prizes that have just passed in front of them on a conveyor belt. Amazingly, this format has never changed and is perhaps the show’s strength. What has changed are the hosts. Jim Davidson has already had his say on the suitability of new hosts Mel and Sue, but on paper, they are good choices; they had brilliant rapport with the contestants on Bake Off so in theory they should work well with the contestants on The Generation Game. The problem is that they excel in low key situations i.e. they have a wonderful supportive/conspiratorial style on Bake Off, whereas what a shiny floor show like The Generation Game needs is a big top shouty ringleader. Neither of them plays particularly well to a big audience and you get the feeling that they are forcing themselves to be all teeth and tinsel, when they are more comfortable with tea and an encouraging talk. Saying that, there are very few presenters who can pull that big light entertainment gig off. Graham Norton can, but IMHO Dermot O’Leary can’t. Ant and Dec certainly can, but alas Stephen Mulhern can’t. The Generation Game is just not the right vehicle for Mel and Sue. In these days of celebrity obsession, the producers have upped the celeb quota with the inclusion of Richard Osman and Lorraine Kelly as a panel. A panel of what? They don’t score, they just say, “that was fun” and cash the cheque. 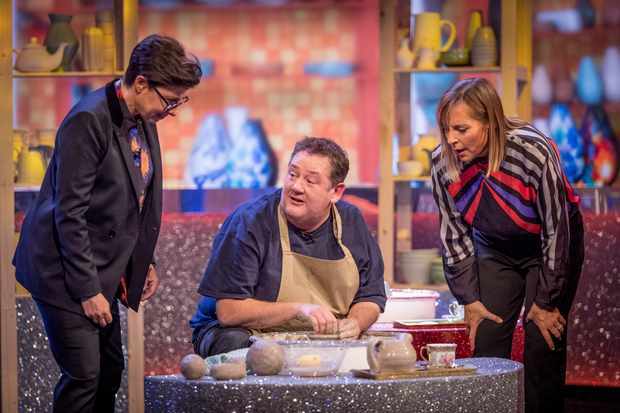 However, getting Jonny Vegas to be the expert on the potter’s wheel challenge was genius. This was the round where I was laughing out loud. I have concluded that like cats on the internet, I could just watch people making a mess of pottery all day. Unfortunately, the laughing soon stopped. The Marching band challenge has been replaced with Bollywood dancing and then the next set of contestants had to make sausages and spin plates (not at the same time…although that would have been more entertaining). If some of these challenges all sound familiar it’s because they are classic Generation Game fayre. The originals are routinely wheeled out on clips shows, so it’s not just the format which is over forty years old, it’s the games as well. Presumably for episode two they will bring out the making the meringue nest or icing the cake, but with the addition of safety goggles. (Safety first, fun last!) The end game is still the acting game, featuring Martin Kemp and a couple from TOWIE (presumably to keep the millennial audience watching) and then it’s on to the conveyor belt. The conveyor belt is the thing of legends and has always and will always feature a cuddly toy. What this 2018 prize grab also included was a hairdryer, a shoe rack and a canteen of cutlery. Yes, you read correctly…a canteen of cutlery! I’m pretty sure that all these were also paraded in front of a kipper tie wearing Bruce Forsyth back in 1971. If you compare these prizes with those on offer the previous night on Saturday Night Takeaway, I think you start to realise why the show is set to fail. It hasn’t changed…at all. Interestingly enough, the first run was axed after ten years in 1981 as ITV’s Game for Laugh was hitting it hard in the ratings and twenty years later it was Pop Idol which did it for Jim Davidson. Yes, audiences like nostalgia, but only in small doses. The Generation Game could still survive as a one-off Christmas Special in the same way that Fools and Horses did, but in the cut and thrust of weekend night time TV, it just feels a wee bit stale and dated. It’s a shame and the BBC really do need to find a new vehicle for Mel and Sue which plays to their original strengths instead of leaving them to step into some else’s old shoes. The Generation Game is is on Sunday evenings at 8:00 pm on BBC One and on iPlayer. ← Save Me – Sky Atlantic. Full series in demand. Get rid of the two idiots on the Sofa and then you will be half way there, because if you have a look at the history of the Generation game there is NO IDIOTS ON A SOFA!!!!! !